You are at:Home»Featured»VIRAL PHOTO TAKEN AT RAFFLES PLACE IS ACTUALLY A PHOTO AD BY AN APP! 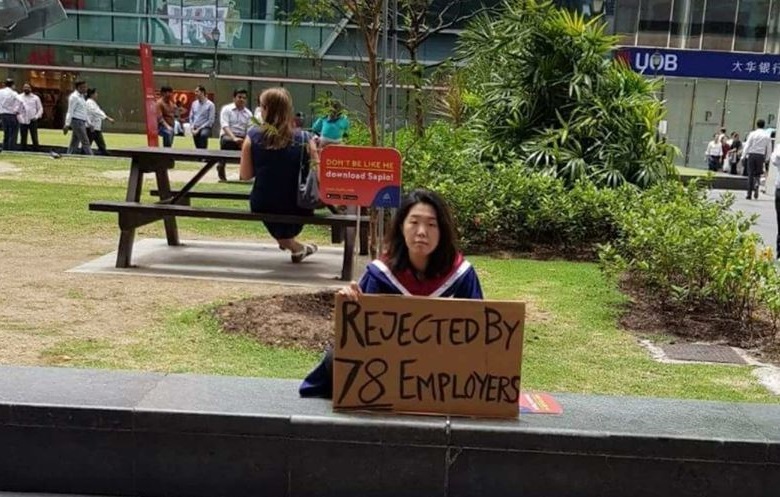 Editor’s note: though the photo is a advertisement for a online apps it resonates with many of us because it’s a true reflection of the sad state of affairs on the ground for many jobless Singaporean PMETs who are being displaced. Previous ArticleKUDO TO STATION MANAGER OF MARSLING FOR GOING THE EXTRA MILE FOR CUSTOMER! Next Article NETIZEN CLAIMS THAT THE WAIT TO SEE A OTTHOPEDIC SPECIALIST FOR HIS SWOLLEN LEG IS A 5 MONTH WAIT!